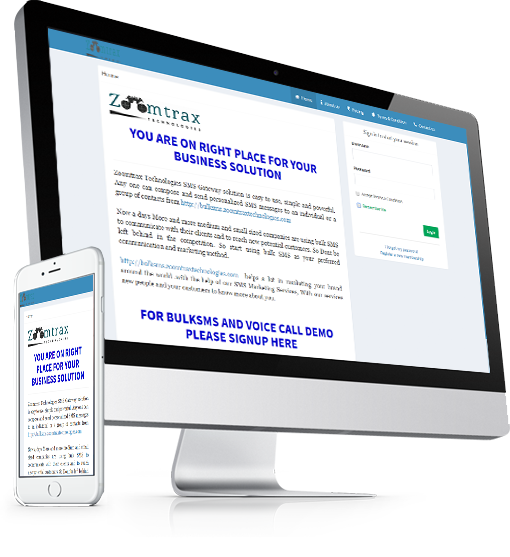 Zoomtrax Technologies is a mobile SMS messaging service provider enables hassle free BULK messaging facility to individuals, businesses and corporations. We give copiously scalable and price effective SMS marketing solutions to our customers to send bulk outbound text messages to mobile phones. You Brand VALUE – mobile phones SMS database marketing is remarkably conversion optimized sub-set of mobile ads alleviates harvesting desired output. You Brand AFFORDABILITY – Text SMS marketing is exceptionally low priced as compared to other relatively exorbitant marketing platforms. Though this is a challenge for some businesses, the 160-character length of SMS is a boon for marketing. It forces you to be clear and concise. Instead of having your subscribers slog through content that isn’t always relevant, SMS gets to the point immediately without anything that is unnecessary. To make this even easier, zoomtraxtechnologies.com offers short codes for easy two-way communication. Delivery :- Only Non-DND Numbers. API Available :- HTTP, PHP, VB, VB6, ASP.NET/C#. Instant 0-30 Sec delivery time of Sms. Were you can send Information or Update of msgs without any approval to DND & non DND numbers with 6 digit sender i.d as ( ZMTRAX ) through API Integration on your Website or Software . Delivery :- Non-DND & DND Numbers. Were you can send any type of msgs without any approval to DND & non DND numbers with 6 digit alphabetic id ( AXISBK, ICICIB ) through Zoomtrax Technologies SMS Web Application Platform. Please contact Zoomtrax Technologies Sales Team for Availing Discounts after purchase of your Plans.